I bought my house about 8 years ago and found out it was built on part of a mill foundation.I found out by accident when a friend of mine ask me; do you know what that big round thing sticking out of the ground is?And I said sewer lid?.She said nope guess again.After my relief I said alien artifact?or something like that anyway she set me straight and I started learning about mills ever since.Not only did I find more millstones but the foundation leading up to and under my house and large rocks/boulders all buried in dirt I'm not done yet and I'm still learning.This millstone weighs in at 2200lbs. I have 2 smaller ones and should be a mate to the big one somewhere. Now you have something in common with William Shatner... Did you see American Pickers last night? Hi everybody I was surprised by the responce thankyou!.I've had this sitting around for awhile now and thanks to american pickers every wantabe picker is going to stop by and offer me a hundred dollers for it.Thing is if they came by before I knew what it was(or worth)I'd of given it to em.Mine is quite differant than the ones that collector had at least what was shown,his are from france and are more or less custom made for certain applacations rather complex really.Mine may have been quarried here, its granite and one big piece from my research they did make some here,they seem to be less common.The ones from france come in pairs and the blades cut in opposite directions.Mine probably laid down and stones rolled around on top of it.It would of produced course grain like for livestock feed.Believe it or not I've seen millstones sell for as much as 6000.00 so you can bet I'll be digging up the rest of the yard this summer.As far as moving them maybe Captain Kirk will let me borrow the vulcan anti gravity millstone relocater thingy. Very cool! Not many people have these stones just sitting around! You're lucky to have them. Thankyou,I guess I've always been more lucky than good.Whats interesting is the more I look into this mill I have more questions than answers.Which makes it a load of fun. I just found this site. I know what you mean. I inherited some property from my Great Uncle who just passed away in January. 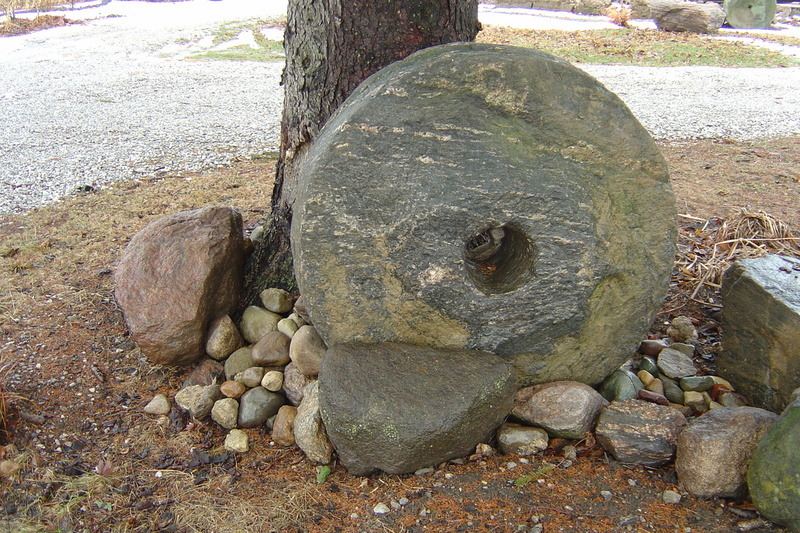 I went around the property and actually found two of the millstones. I wasn't sure what they were either. According to my mother, my great grandmother used it in her younger years. She was born in 1900 and passed away in 1988. I am interested in selling the pair that I have. Just have to be careful though on who you talk to about it. I contacted a man from millstone.com and told him about them. I looked at his website and he has hundreds. There was was one there that was broke in half and he was asking $2000.00 for it. He only offered me $800.00 for the pair. Mine are in good shape and even has the rod that goes in the middle. I think it was used to grind corn into mill. I'm not sure of the history as of yet, but I will be looking into it to find out more. Good luck with whatever you choose to do. Carol....can you post a picture of your millstone please? Is it for sale ? We just bought a house and found what appears to be a mill stone. I can't find any pictures of it online.....this one is maybe 30-36 inches in diameter, and maybe 6-8 inches thick. The center hole is at least five inches in diameter, and the stone itself is a deep brown color. Any ideas? I can't find answers anywhere else.